Can You Eat Russian Sage? What Is the Proper Way to Get Sage From a Sage Plant? While some gardeners differentiate between sage and salvia in a garden, these two plants are actually the same plant. The name salvia is the genus name that includes all sage and salvia plants. When you include sage in your herb garden, you have a flourishing and attractive herb that will grow readily to provide a bountiful sage harvest. As your sage plant grows throughout the growing season, deadhead it to keep it producing more leaves. Clip sage blossoms from the sage plant as they dry and fade. Use the pruning shears to remove the blossoms immediately beneath them where they attach to the stems. Increase the fullness of your sage plant by deadheading the spent blossoms down to the point of the first lateral stems growing off the main stem. The plant will respond by growing more lateral stems. Deadhead the sage plant by removing the entire stem of the dried and faded blooms to encourage the sage plant to bloom again before the growing season ends. Monitor the sage plant as it continues to grow and continue to deadhead the blossoms as they fade (using whichever deadheading method you choose). To reverse a spell or to protect a person from the "Evil Eye," it was believed a good idea to add sage to the remedy. Sage has been said to be able to slow down the aging process. An ancient Arabian proverb states, "How can a man die when he has sage in his garden?" According to The Herb Book by John Lust, plants used for their medicinal properties to affect the liver or arterial system are ruled by the planet Jupiter. Sage is said to grow in the garden of a house ruled by a woman, yet others believe sage flourishes according to the fortunes of the man of the house and will wither when he dies. The burning of sage leaves was thought to banish evil spirits by making them sick; its burning was also believed to attract money. Pinch back the sage plant during its first growing season after planting. Use your thumb and forefinger to snip off the growing tips of the sage's branches. This encourages a more dense, multi-branched shrub and more prolific flowering, according to the Alabama Cooperative Extension. Prune the sage in the spring of its third year, according to Purdue University, and every spring thereafter. This helps keep the plant from becoming too woody. Woody plants don't produce as much foliage and blossoms. Measure a third of the plant's branch, starting from its growing tip. Identify a leaf node nearest the 1/3 mark. A leaf node is the bump on the branch where leaves sprout. Cut off the end of the branch just past the leaf node. New foliage will sprout from the node, helping to keep the sage productive and growing strong. Discard all removed vegetation or chop it into inch-long pieces and add it to your compost pile. Choose a garden site. 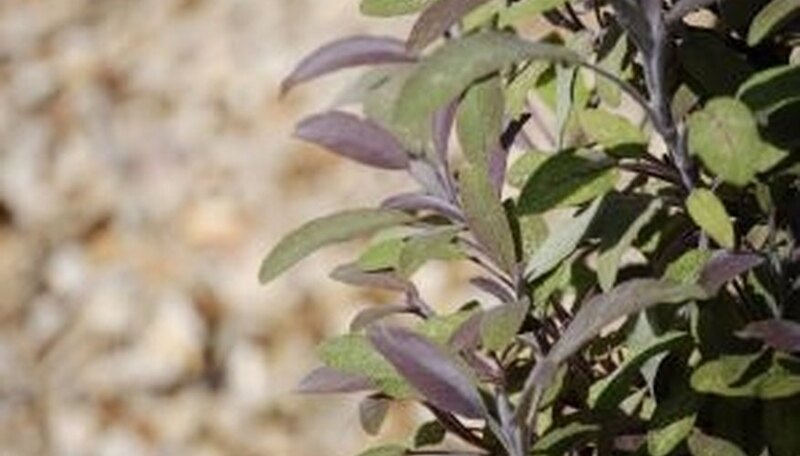 Texas sage thrives best in full sun but can handle limited amounts of shade, according to Texas A&M University. Prepare the gardening area. Though the sage will grow in even poor soils, according to Texas A&M University, the plant will respond positively to amended soil. Use a spade to breakup the soil to a depth of 6 inches. Clemson University recommends stirring in a couple inches of compost, followed with a general all-purpose 10-10-10 fertilize applied at a rate of 1/2 lb. for every 50 square feet of gardening space. Sow the Texas sage seeds. Bury the seed 3/4 inch deep and space the seeds apart by approximately 1 foot. Water the gardening area twice daily or as necessary to keep the soil surface moist. The seeds will usually germinate within two weeks, according to Washington State University. Find a planting site that receives full sunlight. Select a site where the soil is well-drained and slightly sandy. Dig a hole for each autumn sage plant that is the same depth as and twice the width of the container or root ball. Space the plants 3 to 5 feet apart. Place the root ball into the planting hole and backfill the soil into the hole, tamping the dirt down around the roots. Water the soil around the autumn sage plant to moisten it. Water your autumn sage to supplement rainfall through the growing season every four to six days and every seven to 10 days during winter. Don’t allow the soil to dry out completely. Prune away dead and damaged stems in late winter and midsummer. Spread a 2-inch layer of mulch around the plant in the fall to protect it against winter cold. Cut sage foliage back to 4 to 6 inches from the ground in the spring when new growth appears. Make cuts at the base of the leaves where they join the main stem, or cut bluntly across the top of the entire plant. Remove any dead or decaying plant material from around the plant. Cut sage back by 6 inches when growth reaches a height of 12 inches. Greg Stack, Extension Educator at the University of Illinois, explains that this causes the plant to grow with dense, compact foliage. Cut sage back by several inches after blooming to encourage new growth. Cut back the Russian sage in the late winter or early spring before the plant begins growing for the new season. Use pruning shears to remove all growth, leaving only 4 to 6 inches of stems growing up from the crown of the plant. Deadhead the Russian sage when the blossoms begin to fade in the second half of the summer. Use pruning shears to remove the flowers, cutting the stems where the flowers stop along the stems. Watch for a second bloom after you deadhead the Russian sage. If this occurs, leave the second bloom on the plants throughout the winter to add winter décor to your flower garden. Russian sage isn't sage at all. It is not edible and is in actuality a poisonous plant. Never confuse sage with the "Russian sage" plant varieties. Scarlet sage grows up to 3 feet tall on square stems. The leaves and stems are bright green. The bright red flowers are 1 inch long and tubular in shape. Scarlet sage requires partial to full sun for optimal blooms. Soil needs to be well-drained. Seeds should be sown in late winter or early spring at a depth of 1/16 inch. The soil should be kept moist. A general flower fertilizer should be used once per month. Scarlet sage germinates in 10 to 30 days. Flowers will bloom from April until the first frost. Scarlet sage is a noninvasive flower that will reseed itself annually. It is also deer resistant. Plant container-grown plants in the spring in a sunny location. Soil should be well-drained. Plants should be placed at least two feet apart. Dig a hole larger than the root ball, place the plant in, cover with soil and compact, so there are no air pockets. Water generously. To grow from seed, you can start them indoors and transplant the seedlings outdoors in spring, spacing as in Step 1. Provide sage with mulch in the winter in colder climates. Cut leaves for culinary purposes at any time. For dried leaves, snip sprigs in late morning, after dew has dried. Place bunches of sprigs in a dark, dry place, hanging them upside down. Check weekly. To refresh your purple sage the following year, cut back to the plant's base in early spring before any growth appears. This will encourage a fuller, bushier plant come summer. 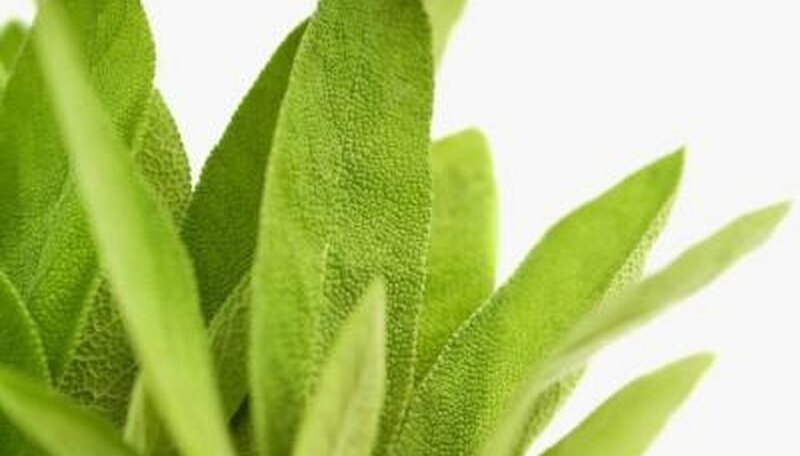 Allow any moisture, such as dew or rain, to evaporate from the leaves of the sage plant. Choose a time in the morning hours to harvest. The afternoon sun can cause transpiration of the leaves, lowering the level of aromatic chemicals in the plants. Use scissors to cut sage leaves from stems. Cut as close to the base of each leaf as possible to prevent damage to the main part of the plant. Select an area of Oklahoma to grow white sage in that is at least 2,400 feet above sea level. White sage grows at elevations between 4,400 and 8,000 feet above sea level. Most of the Oklahoma panhandle is above 2,500 feet in elevation, and has cool enough nighttime temperatures for White Sage to thrive. The panhandle also contains a clay loam soil texture that white sage thrives in. Choose a location on your property that is very dry for your white sage. California white sage is a drought tolerant plant that will do poorly if exposed to water. In the desert, white sage grows on the sides of hills and mesas, or in the bottom of dry valleys. Dig a planting hole for your white sage that is slightly larger than the plant’s root ball. Place the root ball into the soil and cover it with dirt. Water very lightly. White sage thrives in dry areas that receive as little as 5 inches of rain yearly.